Joachim Klang and Alex Jones are a duo of builders well known within the LEGO community, and their creations have appeared on The Brothers Brick numerous times. 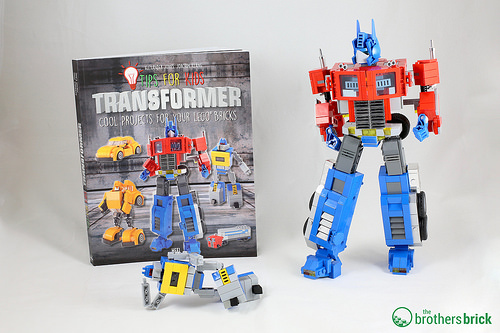 Now they’ve got a new book to share some of their techniques: Tips for Kids – Transformers: Cool Projects for Your LEGO® Bricks. Over the past few months, we’ve already highlighted a few of the builds that the pair created for the book, but now we are able to review the book itself. The 208-page soft-cover book is a very visual book with minimal text, and includes 200 colour illustrations. 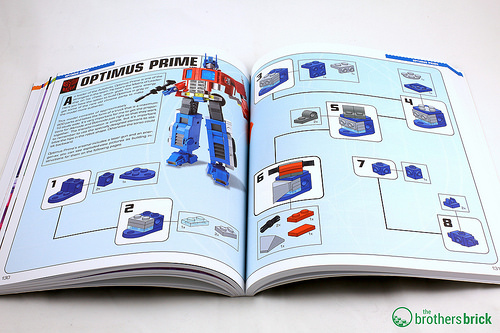 There are detailed instructions for 9 models (plus 2 weapon systems) which range from a mini Grimlock built with 24 pieces to the awesome 800-piece transforming Optimus Prime that you see in the image above. The 9 models are The Ark, Nemesis, Transformation Probe, Mini Optimus Prime, Grimlock, Bumblebee, Soundwave, Constructicons, Optimus Prime, while the weapons are the Energon-ax and a laser gun. In the foreword, Joachim explains that Alex has built more models than could be included in the book, so many extra models are pictured to inspire builders to create their own models using parts from their collections. The Transformers in the image below, for example, are among those inspirational models. 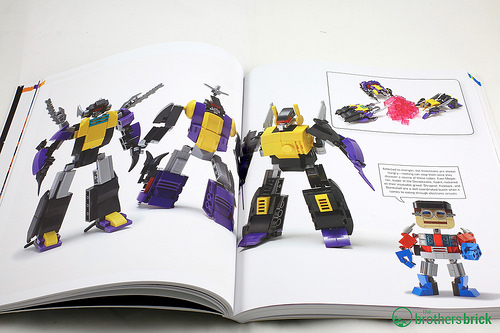 Apart from the introductory pages, the rest of the book is mainly beautiful images of the Transformers in their brick-built scenes, along with the instructions themselves. A brick-built Alex figure also gives helpful tips and information throughout (for example, pointing out that a step uses a 1×1 brick with one stud rather than 2 studs, to avoid confusion). The instructions are excellent, with clear images, sensible step breaks, and accurate colours. With mini Alex pointing out potential pitfalls, the complicated models come together easily. At times, fan-created instructions can suffer a variety of factors which hamper the building process, from a mix of poor colour differentiation, lack of parts lists, or unclear steps. Thankfully, none of those issues are present here. I built a few models, starting off with Soundwave, since I had most of the parts in my collection — albeit one was in a different colour, and I ‘borrowed’ another part from a LEGO buddy (for some reason I only had one blue 1×1 plate with tooth). 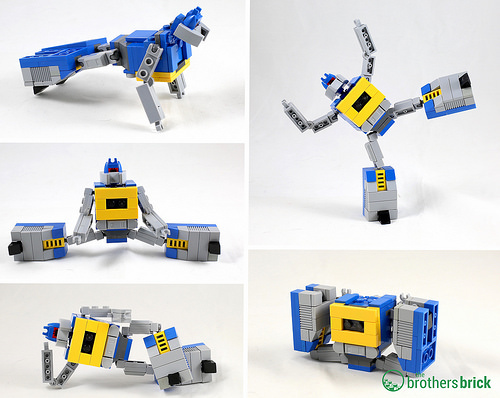 Soundwave is a fairly simple build that results in a fun, poseable robot who transforms into a boombox. I also built the non-transforming mini Optimus Prime in his juggernaut state. This can be built using the metallic silver parts if you have them, or with any of the grey tones if you do not. As you can see, I was easily able to utilise the parts I had and create the model with slightly different coloured parts than called for in the instructions. 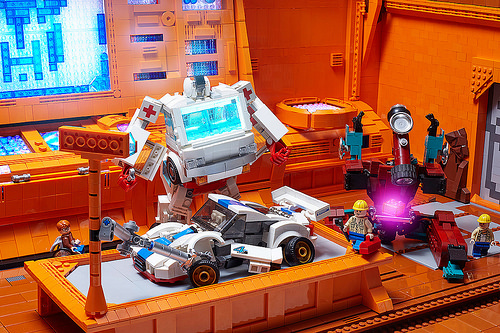 I imagine that most readers will either try to find the exact parts and purchase them on a secondary market (such as Bricklink or Brickowl) or do as I did and use the instructions as a guide to work with the parts already in their collection, replacing parts or finding other ways to work around shortcomings. While there are some specific parts required for the models, none are rare or expensive (especially if you go for grey instead of metallic silver). 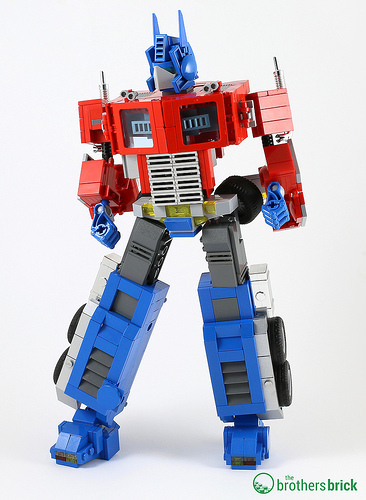 Finally, I built the transforming Optimus Prime, which is the largest model in the book with 800 parts. 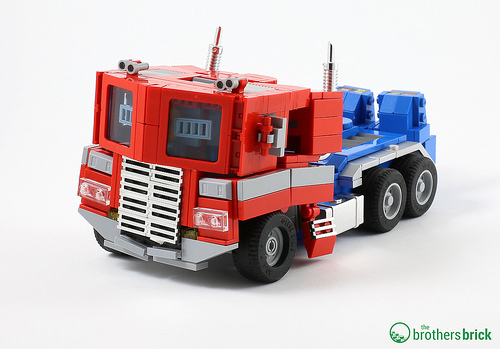 Optimus Prime is a bit of a fiddly build at times, but the instructions are nice and clear and, as with all the models, there is a parts list in both image style and as a table with element IDs. My Optimus Prime was a little loose-limbed and floppy in his robot state, but the use of Mixel joints is an essential part of his ability to transform. It’s difficult to envisage how to build a transforming model without having such flexibility, but the downside is the instability of the model in certain poses. One of the ways that Alex improves the stability of Optimus in his robot state is to have a small removable ‘bracket’ at the back that helps to effectively stabilise his pelvis and torso. It takes a bit of practice to transform Optimus, as the first few attempts result in certain parts pinging off, but once you have worked out where to push and pull, the transformation becomes much easier. However, I still had a few gaps on my juggernaut even after practicing the transformation numerous times. Overall, this is a beautifully illustrated book. The brick-build images, especially the ones that are more inspirational, have been masterfully created by Alex and Joachim and the print quality does them justice. Sadly, some fill a double-page spread (such as the one below) resulting in a seam down the middle of the image, but this is a necessary consequence of showing the images large enough to see all the little details. There’s a lot of inspiration within these 208 pages. The constructed models definitely look the part, and many clever techniques are used that will delight young and adult LEGO fans alike. 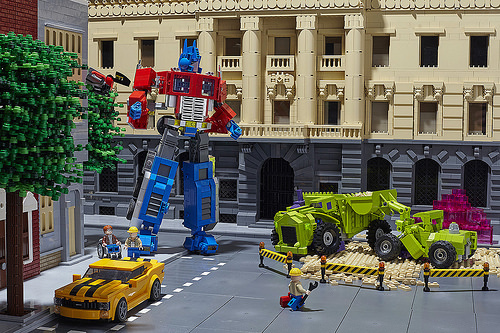 Fans of Transformers and LEGO will definitely enjoy poring over the images, trying out some of the builds and learning techniques from a duo of very talented builders. 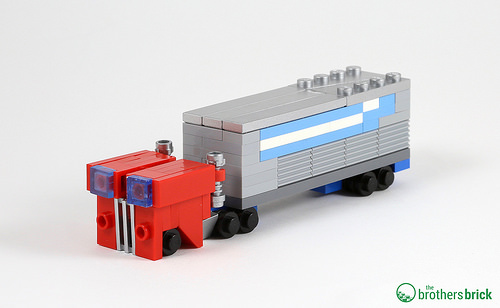 Tips for Kids: Transformers: Cool Projects for your Lego Bricks is currently available from Amazon for $17.49 (14% off). Thanks to Alex Jones for providing The Brothers Brick with a copy of the book to review. Providing TBB with products for review guarantees neither coverage nor positive reviews.